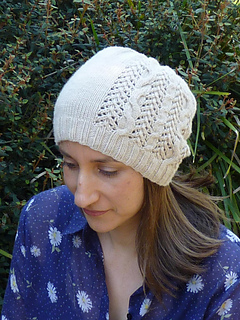 Enjoy a moment with your favourite cuppa and this simple slouchy hat. Lace and cables combine to evoke the bubbles of water boiling in a busy kettle. 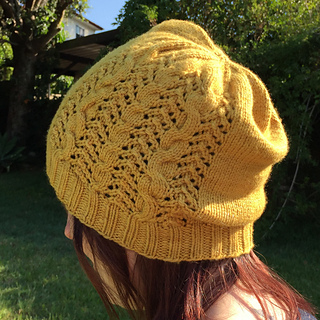 A quick knit with barely a purl in sight, Tea Breeze will be a favourite you’ll want to knit more than once. Tea Breeze samples shown in Augustbird Egret ‘Beyond the Teapot’ (large size) and White Gum Wool 5ply silk/merino ‘Hawthorn’ (small size). Model’s head measures 54.5cm/21.5”. Pattern has been professionally tech edited and test knitted. Written and charted instructions included. 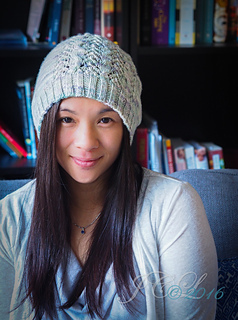 Tea Breeze is a slouchy hat with a stretchy brim that will fit a variety of head sizes, from older children to adults. Choose a size approximately 5cm/2” smaller than your head circumference.